Petunias are generally considered one of the easiest flowering annuals to grow as bedding or hanging plants. Unfortunately, this preconception leads gardeners to believe that petunias should thrive in any conditions. If your petunias are dying, first make sure their basic requirements are being met. A few minor adjustments may be all it takes to pull your petunias back from the brink and allow them to flourish for the rest of the season. Too many petunia plants in one container can lead to overcrowding later in the season. Hanging petunias should be planted in a houseplant-type potting soil that drains well. Use a potting mix that contains perlite or sand for improved drainage. Check to see if the potting mix drains well by squeezing a handful of it one day after watering. If water can be squeezed out of the soil, it is not draining quickly enough. 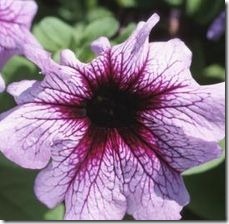 Soil that stays too wet for too long is a common cause of petunia decline and death. Mix 12-12-12 fertilizer into the potting mix according to manufacturer’s recommendations before planting the petunias.Potting soil that is sold with fertilizer already mixed in can be used as well. Do not give fertilizer to sickly plants. The container must have drain holes in the bottom to allow excess water to drain away. Hanging petunias can also be planted in wire baskets lined with sphagnum moss or coir liners. A long-handled spray attachment makes watering hanging planters easier. Petunias grown in hanging containers need to be watered more often than those grown as bedding plants. Depending on the heat and humidity, they may have to be watered once or even twice each day. Check the dampness of the soil every day. Petunias should be kept evenly moist, not dripping wet. When the soil feels like it’s beginning to dry, water the petunia. Pour the water over the entire surface of the potting mix rather than in one area at the side of the container. This will provide moisture evenly to all of the roots rather than only a small portion of them on one side. Lanky or leggy plant growth and reduced blooming can be caused by too much shade. Petunias can be grown in full sun or partial shade. If they are planted in good potting mix in a container that drains well and are being watered properly but are still struggling, they may not be getting the right amount of sunlight. Six to eight hours of direct sunlight each day is considered full sun exposure. While petunias generally thrive in full sun, hot midday sun may be too much for them, especially in hot climates. Try moving them to a location that receives morning and evening sun with shade in the afternoon. If they are dying in a partial shade position where they are only getting two to four hours of sunlight each day, move them to a sunnier location. Viral diseases can cause flowers to be streaked, discolored and deformed. Petunias can develop crown or root rot, gray mold, verticillium wilt and viral diseases. Crown and root rot will cause wilted leaves and yellowed stems with stunted plant growth. The roots and stems will become soft and decay. Gray mold or botrytis blight will cause symptoms similar to root rot as well as fuzzy gray spots. Verticillium wilt causes the leaves to turn yellow and wilt, eventually turning brown and dying. Viral diseases cause a variety of symptoms including stunted foliage that has spots or streaks. Unfortunately, once petunias develop these maladies, they usually cannot be saved. Fortunately, petunias are commonly available throughout the growing season and are relatively inexpensive. The best course of action is to remove the diseased plant and start over. Thoroughly disinfect the hanging container, however, before re-using it, and use new, fresh potting mix.